LIAM MILLER IS on the look-out for a new club having turned down a contract extension at Australian club Perth Glory. The Cork native has spent two years Down Under after arriving from Hibernian in 2011 but has decided against adding a third. Undoubtedly, it is a far cry from where the 32-year-old spent the first half of his career. A schoolboy stint with Ballincollig FC saw him impress enough to earn a dream move to SPL giants Celtic, where it took Miller some time to establish himself at senior level. During the 2003-04 season, however, a goal against Lyon in the Champions League was one of the highlights as the midfielder cemented his place in Martin O’Neill’s title-winning side. To the disgust of many Hoops fans, Miller jumped at the chance to move to Manchester United when Alex Ferguson came calling in 2004. Unfair but inevitable comparisons to Roy Keane were made but Miller failed to live up to expectations and was rarely used in the first team before being shown the door two years later after a loan spell with Leeds. At Sunderland he was to link up with Keane, who was now a manager, but three years on, he was on the move again – a short-lived spell at QPR was followed by some time back in the SPL, with Hibernian. He arguably enjoyed his best football at Hibs but joined the likes of Dwight Yorke, Robbie Fowler and, more recently Alessandro Del Piero and Emile Heskey, by starting a new life in Australia in 2011. Or how about a training video… like Owen Hargreaves? Email “Liam Miller needs a new club - here's what his CV would look like”. 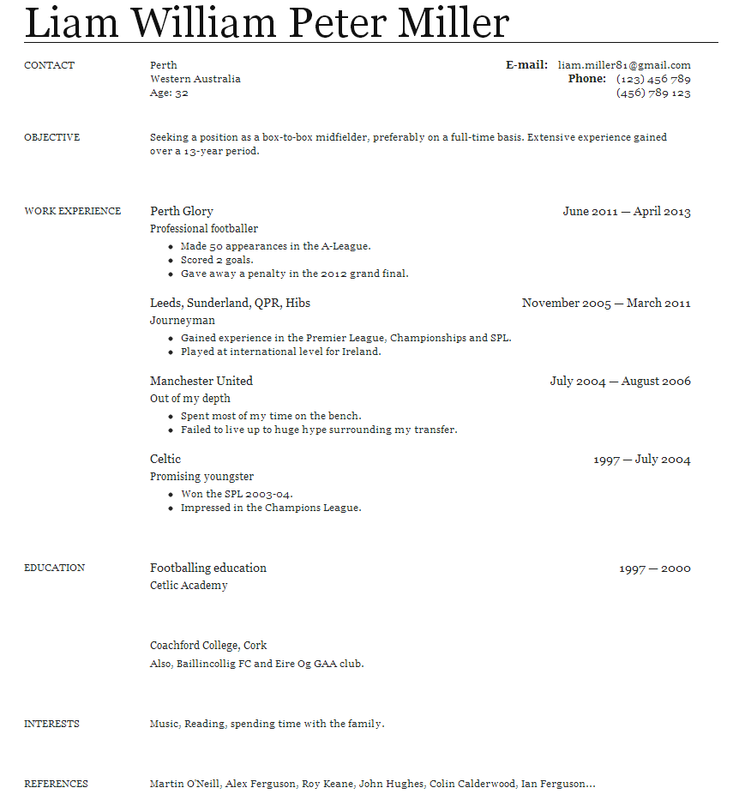 Feedback on “Liam Miller needs a new club - here's what his CV would look like”.